Both are mirrorless digital cameras equipped with built-in Wi-Fi for the convenience of easy and quick data transfer across different devices. Each of them also has an articulating screen so that you can shoot from tight and difficult angles while still seeing exactly what you are shooting. Quite interestingly, their display screens have a similar resolution as well, with 920k dots. Each of them also has a built-in flash and an external flash shoe, so they both are good for flash photography. Neither is built with a weather-proof construction. Getting straight to the point, despite being the older model, Sony a6000 holds numerous advantages over Fujifilm X-A2. To begin with, Sony a6000 is packed with a 24MP sensor while Fujifilm X-A2 only has a 16MP sensor. Sony a6000 has 179 focus points, 51200 maximum ISO, and 11 fps photo burst. On the other hand, Fujifilm X-A2 only has 49 focus points, 25600 maximum ISO, and 5.6 fps photo burst. As the result, Sony a6000 not only produces larger images, but also captures much more fine details. Sony a6000 is also very much well-known for the exceptional colors it generates. Fujifilm X-A2 is pale in comparison. Sony a6000 is also better than Fujifilm X-A2 for sports photography and snapping the pics of fast-moving objects compared to Fujifilm X-A2. With the high number and the smart system of the focus points, Sony a6000 got no problem focusing and tracking on a certain object. It has a 1/4000s maximum shutter speed, which is decent for the purpose. And with 11 fps photo burst, it has got the speed to capture the moments. Sony a6000 also has a bigger buffer capacity than Fujifilm X-A2. Last but not least, Sony a6000 once again holds the better edge than Fujifilm X-A2 for landscape and HDR photography. Both models support AE bracketing, for sure, which is a feature that allows the camera to take several pictures in burst mode with varying exposures, useful to get all the details and the complete colors of the view. However, Sony a6000 supports AE bracketing for up to plus-minus 5 EV, while Fujifilm X-A2 is limited to plus-minus 1EV. 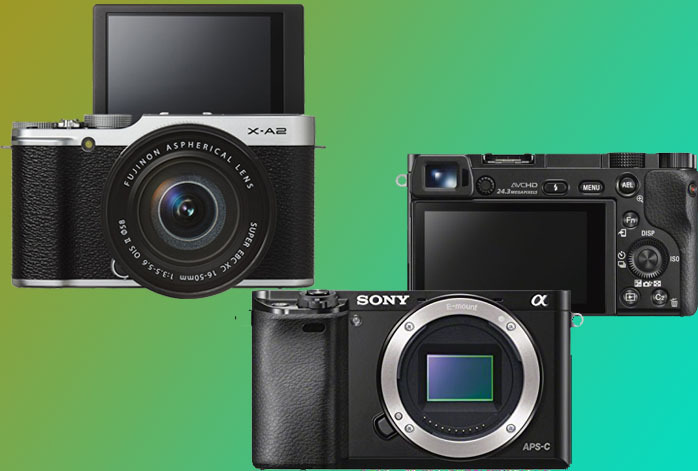 As you can see, Sony a6000 holds numerous advantages over Fujifilm X-A2. Therefore, between the two, you should choose Sony a6000!